Steven is one of the personas from our book, A Web for Everyone. Including people with disabilities in your research is not as hard as you thing. If you open up your recruiting, you may find people with a variety of abilities who are already part of your audience. You can download an overview of all the personas from our Resources page. The personas images, created by Tom Biby, twofinechaps.com, are available on Flickr. Tune in for a new persona every Tuesday until all eight are posted. My only disability is that everyone doesn’t sign. The nice thing about being a graphic artist is that most of the time his work can speak for itself. When he first started working, most reviews were done in meetings, but more and more his agency works with clients using online workspaces. He’s had some projects recently where all of the communication was through the web. Although he likes seeing live reactions, it’s easier for him to participate in the project forum discussions using text rather than audio. His iPhone has also been important. It was his first phone with a good way to do video chat so he could talk to his friends who sign. It’s annoying when videos on the web aren’t captioned. How is he supposed to learn about a new app if the only information is an animated video? Or if he’s the only one in the office who doesn’t get the joke? 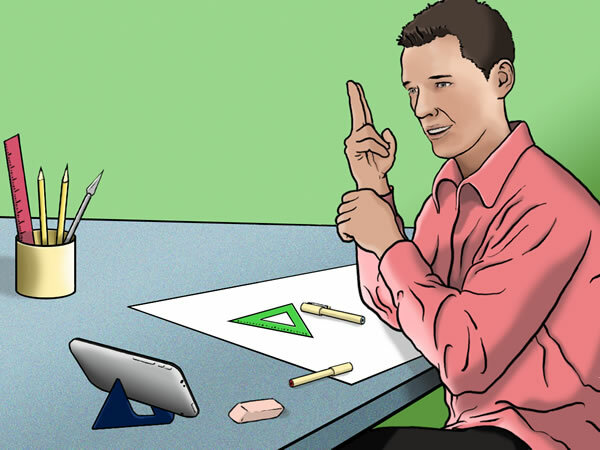 Like many people who learned ASL as their first language, Steven prefers sign, but reads text, since that’s most of what the web is. If a site is just a big wall of text, he’s likely to leave unless he knows it’s got the information he needs. 10.5 million (3.5%) people in the U.S. are deaf or have a significant hearing loss and 48 million people in the U.S. report some degree of hearing loss. 500,000 to 2 million people use American Sign Language (ASL). Sign is not a universal language. There are national versions around the world, such as Auslan (Australian Sign Language) and three different sign languages in Japan.